The House Plan Shop Blog » Narrow Lot? No Problem! For homeowners who prefer an urban environment, a smaller lot size is inevitable because land is in short supply. This is not bad news. Narrow lot house plans can be affordable. Specifically designed for the smaller footprint, narrow lot house plans use clever design techniques to optimize every last inch of space. You definitely won’t get a cookie-cutter home. For green-minded homeowners, narrow lot house plans are recognized as being eco-friendly because of their small ecological footprint. Here’s how to make every square foot you own, attractive, imaginative and yes, even spacious! The square footage of a narrow lot home can vary depending on the number of stories you wish to build. A small single-story home reminiscent of that old suburban staple, the low roof-lined “Rancher,” may only be 1,000 square feet or less. A signature detached row house on the other hand, could offer three stories, four bedrooms and around 3,000 square feet of living space – all built on the same small lot. The minimum lot size? You can squeeze comfort and space into a lot that is 40 feet wide or less. The depth of the home is only limited by the depth of the lot. Narrow lot house plans are typically long and lean to make the most of a deep lot. Traditional Victorian or Cape Cod style homes have clearly articulated rooms. In these floor plans, the kitchen, living room, dining room and den are delineated with walls and doors. This traditional housing style does not work well on a narrow lot where space is at a premium. To maximize space, narrow lot house plans incorporate open, airy spaces into their design. Each room may be used for a number of purposes – a combined kitchen, dining room and living space, for example, or an open plan children’s area that accommodates sleep, study and play. Redundant spaces such as corridors are omitted, instead there are large, functional, open areas that can be layered on top of each other as you build up. Ample storage solutions – think built-in closets, a pantry, shelves and a kitchen island with plenty of drawers. By building boundary to boundary (where this is permitted) and implementing a variety of space-saving techniques, narrow lot house plans are able to incorporate a myriad of features. If you forget you’re living in a narrow lot home, the plans have done their job properly. In the real estate business, curb appeal is the frosting on the cake. It describes a property’s overall appearance from the street, such as its style, building materials and design. Homes with curb appeal command higher sale prices and generally take less time to sell. Narrow lot house plans are designed to let the exterior details shine. For multi-story homes, you can play up the vertical height by adding floor-to-ceiling windows, columns or a steeply pitched roof. Inviting porches, balconies, landscaping and even flower boxes are great accents that boost the appearance of narrow lot homes. If yard space is limited, your outdoor area can be designed to feel bigger by installing a vertical garden. Finally, it is worth remembering that all house plans can be customized. 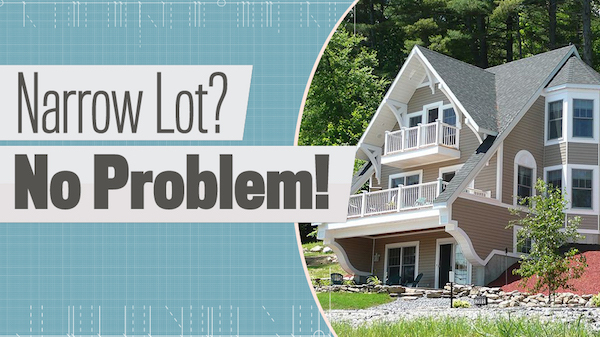 Regardless of lot size, you’ll get precisely the internal space and visual aesthetic you want. Sept 2015 narrow lot house, not able to find corresponding plan on website. Please provide link to house plan. Grey 3 story with walk out basement and balconies. Waterfront home.